Legacy Christian senior Emily Riddle (10) and sophomore Emma Hess (23) double team Yellow Springs freshman Angie Smith, during Saturday’s girls high school basketball game in Xenia. Yellow Springs freshman Aaliyah Longshaw (3) chases down sophomore Kathleen Ahner (21) to prevent a transition layup. XENIA — The Legacy Christian Knights dominated the Yellow Springs Bulldogs on Saturday, Feb. 2 by a score of 76-30. The win gives the Knights a great opportunity to win the Metro Buckeye Conference title. The LCA played well in all phases of the game. The defense looked sharp taking advantage of multiple forced turnovers while the offense ran smoothly. However, both sides of the ball were helped by great rebounding. The Knights held a 94-18 advantage in rebounding. Combs said the team noticed Yellow Springs seemed to want to control the inside on defense, but they would sometimes give up easy perimeter shots. “We worked on how to move the ball enough times that the defense makes mistakes and we get open shots,” Combs said. Yellow Springs coach Tim Minnich said they are focused on developing their team. Yellow Springs freshman Angie Smith, in particular, has already established herself as a strong player for the Bulldogs (10-9, 6-5 MBC). She leads the Metro Buckeye Conference in scoring, with a 23.5 points per game average. Minnich said she moved into 29th all-time in the state for free throws made in a single season. Currently, Smith has hit 163 of 241 free-throw tries this season for a 67.6 percent average. 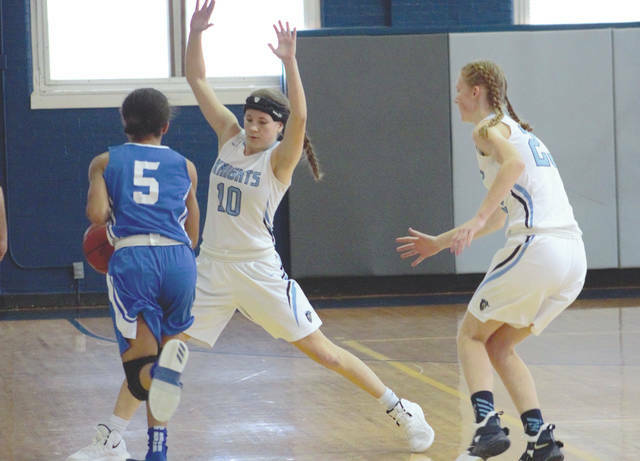 Averaging just over 8.5 free throws made per game, she’s on pace to finish with 188 for the regular season, which would put her 15th in the Ohio High School Athletic Association record books for most free throws in a season. Smith led the Bulldogs with 27 of their 30 points while Emily Riddle led the Knights with 21. 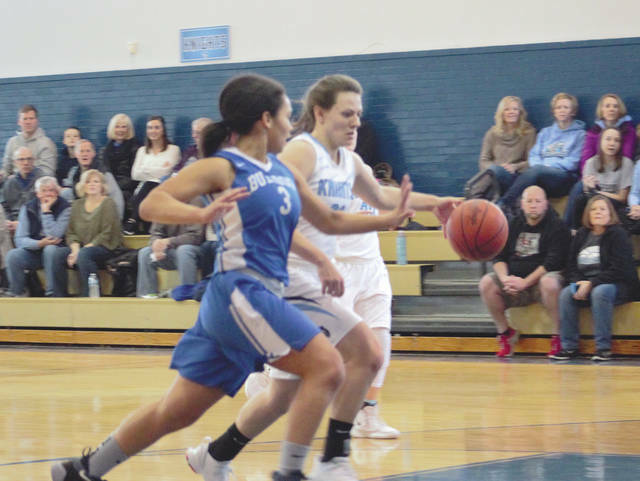 LCA’s Margaret Kensinger scored 16 points, Kathleen Ahner score nine points for the Knights while Emily Hess, the MBC’s no. 2 scoring leader with a 16.1 ppg average, finished with seven. Yellow Springs hosts Dayton Christian in an MBC contest at 6:45 p.m. Wednesday, Feb. 6 for its next game. The Knights (17-2, 9-0 MBC) will be looking to maintain their position atop the conference as a big game against last year’s conference champion, Troy Christian, looms at 7:30 p.m. on Thursday, Feb. 7. Combs said he is glad their game against Troy will be at home.